Do you do custom/commission work? I no longer do commission work for individuals, but I often do custom artwork for licensing purposes. 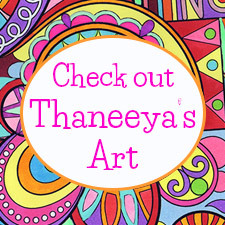 If you want to license my art for use on your products, please see my licensing page for more info. I don't do logos, branding, graphic design, etc for other businesses or individuals. I only create art for which I retain all rights. If you're interested in commissioning a drawing or painting, many of the artists on my Featured Artists page welcome custom work. Can you look at my artwork and tell me what you think? It's great that you value my opinion, so thank you for that! I'm sorry I don't have time to comment on your artwork though. How can I find a publisher (to publish my coloring books / how-to books, etc)? The first step is to create a website to showcase your artwork. You don't need to be a web designer to have a stunning website these days, when services like Squarespace offer a range of professional-looking templates. I know a few talented artists who don't even have their own websites, yet they wonder why they've never been able to launch their art careers. If you want to get published, having a website is one basic factor that shows that you approach your art as a business. Once you have a good website that showcases your artwork, it's time to build a following on social media. Create accounts on sites like Facebook, Instagram, etc devoted solely to your art, and link to those profiles from your website. This can help generate a buzz around your art, and publishers are likely to be more interested in your work if they see that others are enthusiastic about your art. If you want to publish art instruction books, create a website or blog where you post tutorials with professional-quality photos and step-by-step instructions. This shows publishers your teaching style, writing style and art style. Once you've posted a few tutorials that you're really proud of, research publishers that publish these types of books. Many of them have submission guidelines on their website which will explain how to approach them with a proposal. If you want to publish calendars, create 12-13 images in a square format, sharing a similar theme. Research calendar publishers and follow their submission guidelines. If you want to publish coloring books, brainstorm a concept (theme) for your book and create at least 5-6 sample images. Research coloring book publishers and follow their submission guidelines. To research publishers who might be interested in your work, go to a bookstore and look at books/calendars/etc that are similar to what you'd like to publish. 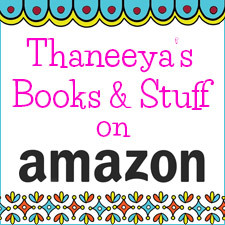 Make a list of the publishers you find and then look them up online. You should be able to find their submission guidelines and contact info on their websites. I'm sorry I can't provide any contact info for my publishers, but if you do some research you should be able to find several publishers who match your criteria. How do you self-publish your printable coloring e-books? To create my printable coloring pages, I scanned each drawing at a high resolution (300dpi). After making some Photoshop adjustments (mainly to adjust the contrast to ensure that the white areas were pure white and the black areas were a rich black), I saved the images as PNGs. Next I put the images into Open Office (free software, similar to Word) and saved the document in PDF format. This is just one way to do it - I'm sure there are many other ways, so feel free to do further research and experiment. 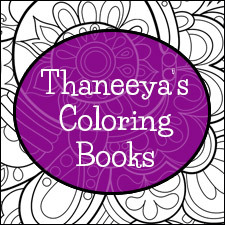 There are a variety of online services that allow you to sell digital goods, such as E-Junkie, but for total beginners I'd suggest selling your coloring e-books on Etsy, because they make the process so easy. You can also easily sell individual coloring pages on Etsy. I colored one of your coloring pages and would like to post it to social media or on my website. Is that okay? Yes, absolutely! I just ask that you keep the copyright info intact at the bottom of the page or credit me in your description as the creator of the original line art. Please note that my art (colored or not) cannot be used for commercial purposes. When it comes to painting, my preferred medium is acrylic. For drawing, I enjoy colored pencils. I've also started exploring the use of the iPad as an art tool and frequently use many wonderful apps, such as Procreate and iDraw, to create digital art. Why do you use the art materials that you do? I work in a variety of media, but the ones I use most are probably acrylics, colored pencil and digital media (mainly iPad apps such as Procreate and iDraw). I love acrylics because they are non-toxic and non-smelly, and I feel that they are a good medium for expressing the ideas that I want to express. I like the bright, boldness of the colors. I also like that acrylics are very forgiving, in the sense that if I make a mistake, I can easily paint over it. I like colored pencil because it is a very portable medium, so I can use them anywhere, and they require minimal preparation and clean-up. I love the rich and subtle colors that can be achieved through layering. The iPad is an awesome tool for art-making because there are some really powerful, yet inexpensive, art-making apps available. It's the most portable art tool I've found since it acts as a "canvas", a "medium" and a "storage portfolio" all in one! What brand of acrylics do you use? I use either Liquitex (medium or high viscosity) or Golden. For more information, see my guide to buying acrylic paint. My favorites are Prismacolor colored pencils, which I love for their rich depth of color and layering capabilities. I'd like to start making art. How do you recommend I get started? Just go for it! Get yourself some art supplies and just see what happens. There is a ton of how-to information on this site to help you get started. 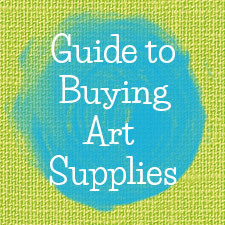 Be sure to check out my Guide to Buying Art Supplies if you're not sure what to get. Taking classes can certainly help too, especially for beginners, as it is always beneficial to get feedback from instructors and from peers. Plus, many people find it motivating to connect with teachers and other artists in real life. Check your local community college or local art center! Or perhaps the people at your local art supply store might know some good places to take classes. If you can't afford art classes or there aren't any available in your community, consider joining an online art community like The Art Colony, where there are lots of beginners and experienced artists helping each other improve their art. I'm a teacher. Can I use your tutorials with my students? Sure! I just ask that you credit Art-is-Fun as the source. I would like to license your art. Who do I contact with my proposal? You can contact my licensing agents at Infinity Licensing. They look forward to hearing from you! I'm interested in discussing a book deal. Awesome! Please send me a message via my contact form with details about you, your publishing company, the book proposal, the amount of the advance, the royalty rate, the time frame, and any other relevant info. I look forward to hearing from you! Can I advertise on your website or pay you to put up a text link? No, I don't have advertising or paid text links on any of my sites.